In this lesson, we will learn how to determine increasing and decreasing functions using the first derivative of a function. Find all possible intervals on which the function is increasing and decreasing. A The function is decreasing on , and increasing on . B The function is decreasing on , and increasing on . C The function is decreasing on , and increasing on . D The function is decreasing on , and increasing on . E The function is decreasing on , and increasing on . Given that 𝑓 ( 𝑥 ) = 2 𝑥 + 2 𝑥 s i n c o s , 0 ≤ 𝑥 ≤ 𝜋 , determine the intervals on which 𝑓 is increasing or decreasing. A 𝑓 is increasing on the intervals  0 , 𝜋 8  and  5 𝜋 8 , 𝜋  and decreasing on the interval  𝜋 8 , 5 𝜋 8  . B 𝑓 is decreasing on the interval  0 , 5 𝜋 8  and decreasing on the interval  5 𝜋 8 , 𝜋  . C 𝑓 is increasing on the interval  𝜋 8 , 5 𝜋 8  and decreasing on the intervals  0 , 𝜋 8  and  5 𝜋 8 , 𝜋  . D 𝑓 is increasing on the interval  7 𝜋 8 , 𝜋  and decreasing on the intervals  3 𝜋 8 , 7 𝜋 8  and  0 , 3 𝜋 8  . E 𝑓 is increasing on the intervals  3 𝜋 8 , 7 𝜋 8  and  0 , 3 𝜋 8  and decreasing on the interval  7 𝜋 8 , 𝜋  . Determine the intervals on which the function 𝑓 ( 𝑥 ) = ( − 3 𝑥 − 1 2 ) 2 is increasing and on which it is decreasing. The concentration 𝐶 of a drug in a patient’s bloodstream 𝑡 hours after injection is given by 𝐶 ( 𝑡 ) = 2 𝑡 3 + 𝑡 2 . How does the concentration 𝐶 change as 𝑡 increases? AThe concentration 𝐶 of the drug increases. BThe concentration 𝐶 of the drug increases up to a certain point and then decreases. CThe concentration 𝐶 of the drug does not change. Determine the intervals on which is increasing or decreasing. A The function is decreasing on and and increasing on and . B The function is decreasing on and and increasing on and . C The function is decreasing on and and increasing on and . D The function is decreasing on and and increasing on and . E The function is decreasing on and and increasing on and . Let 𝑓 ( 𝑥 ) = 3 𝑥 𝑒 4 − 4 𝑥 . Determine the intervals where this function is increasing and where it is decreasing. A 𝑓 is increasing on the interval ] 0 , 1 [ and decreasing on the intervals ] − ∞ , 0 [ and ] 1 , ∞ [ . B 𝑓 is decreasing on the interval ] − 1 , 0 [ and decreasing on the intervals ] − ∞ , − 1 [ and ] 0 , ∞ [ . C 𝑓 is increasing on the intervals ] − ∞ , 0 [ and ] 1 , ∞ [ and decreasing on the interval ] 0 , 1 [ . D 𝑓 is increasing on the interval  3 2 , ∞  and decreasing on the intervals  1 2 , 3 2  and  − ∞ , 1 2  . E 𝑓 is increasing on the intervals  − ∞ , 1 2  and  3 2 , ∞  and decreasing on the interval  1 2 , 3 2  . Given that , find the intervals on which is increasing or decreasing. A is increasing on the interval and decreasing on the interval . B is decreasing on the interval and decreasing on the interval . C is increasing on the interval and decreasing on the interval . D is increasing on the interval and decreasing on the interval . E is increasing on the interval and decreasing on the interval . Find the intervals on which the function is increasing and decreasing. A The function is decreasing on . B The function is decreasing on . CThe function is increasing on . DThe function is increasing on . E The function is decreasing on . AThe function is increasing on and decreasing on . BThe function is increasing on and decreasing on . CThe function is increasing on and decreasing on . DThe function is increasing on and decreasing on . EThe function is increasing on and decreasing on . A The function is increasing on and decreasing on . B The function is increasing on and decreasing on . C The function is increasing on and decreasing on . D The function is increasing on and decreasing on . E The function is increasing on and decreasing on . Determine the intervals on which the function is increasing and decreasing. BThe function is decreasing on and increasing on and . CThe function is decreasing on and increasing on and . DThe function is decreasing on and increasing on and . EThe function is decreasing on and and increasing on . Find the intervals on which the function 𝑓 ( 𝑥 ) = 2 𝑒 − 3 𝑒 + 4 𝑥 𝑥 is either increasing or decreasing. AThe function is increasing on  − ∞ ,  4 3   l n and   4 3  , ∞  l n .
BThe function is increasing on  − ∞ ,  3 4   l n and   3 4  , ∞  l n .
CThe function is decreasing on  − ∞ ,  4 3   l n and   4 3  , ∞  l n .
DThe function is decreasing on ] − ∞ , ∞ [ . EThe function is increasing on ] − ∞ , ∞ [ . Determine the intervals on which the function 𝑓 ( 𝑥 ) = ( 𝑥 + 3 ) | 𝑥 + 3 | is increasing and decreasing. Determine the intervals over which the function 𝑓 ( 𝑥 ) = − | 2 𝑥 | + 2 8 is increasing and over which it is decreasing. Let Find the intervals on which 𝑓 is increasing and where it is decreasing. Determine the intervals on which the function 𝑦 = 3 𝑥 ( 9 𝑥 + 5 ) 2 is increasing and where it is decreasing. Determine the intervals over which the function 𝑓 ( 𝑥 ) = 1 1 𝑥 − 8 𝑥 3 2 is increasing and over which it is decreasing. Given that 𝑓 ( 𝑥 ) = 8 𝑥 − 1 6 𝑥 + 5 4 2 , determine the intervals on which 𝑓 is increasing or decreasing. A 𝑓 is increasing on the intervals ] − 1 , 0 [ and ] 1 , ∞ [ and decreasing on the intervals ] − ∞ , − 1 [ and ] 0 , 1 [ . B 𝑓 is increasing on the intervals ] − 1 , 0 [ and ] 0 , 1 [ and decreasing on the intervals ] − ∞ , − 1 [ and ] 1 , ∞ [ . C 𝑓 is increasing on the intervals ] − ∞ , − 1 [ and ] 0 , 1 [ and decreasing on the intervals ] − 1 , 0 [ and ] 1 , ∞ [ . D 𝑓 is increasing on the intervals ] 1 , ∞ [ and ] − ∞ , − 1 [ and decreasing on the intervals ] − 1 , 0 [ and ] 1 , ∞ [ . E 𝑓 is increasing on the intervals ] − 1 , 0 [ and ] − ∞ , − 1 [ and decreasing on the intervals ] 1 , ∞ [ and ] 0 , 1 [ . Determine the intervals on which the function is increasing or decreasing. AThe function is increasing on and and decreasing on . BThe function is increasing on and decreasing on and . CThe function is increasing on and decreasing on and . DThe function is increasing on and decreasing on and . EThe function is increasing on and and decreasing on . Determine the intervals on which the function 𝑓 ( 𝑥 ) = 3 𝑥 − 9 𝑥 − 4 3 2 is increasing and on which it is decreasing. A 𝑓 is increasing on ] − ∞ , 0 [ , ] 2 , ∞ [ and decreasing on ] 0 , 2 [ . B 𝑓 is decreasing on ] − ∞ , 0 [ , ] 2 , ∞ [ and increasing on ] 0 , 2 [ . C 𝑓 is decreasing on ] − ∞ , 0 [ and increasing on ] 2 , ∞ [ . D 𝑓 is increasing on ] − ∞ , 0 [ and decreasing on ] 2 , ∞ [ . 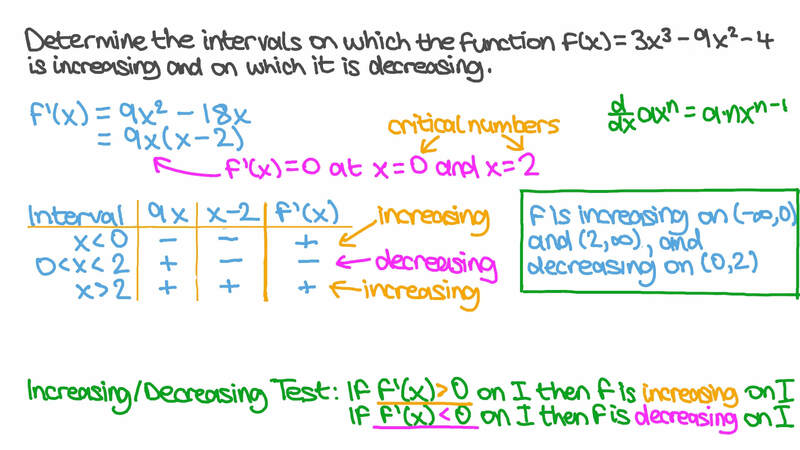 Determine the intervals on which the function , where , is increasing and where it is decreasing. A The function is increasing on . C The function is decreasing on . For , find the intervals on which is increasing or decreasing. A The function is decreasing on and increasing on . B The function is decreasing on and increasing on . C The function is decreasing on and increasing on . D The function is decreasing on and increasing on . E The function is decreasing on and increasing on . Determine the intervals on which the function 𝑓 ( 𝑥 ) = 7 𝑥 𝑥 + 9 2 is increasing and where it is decreasing. Determine the intervals on which the function 𝑓 ( 𝑥 ) = 8 𝑥 − 7 7 𝑥 − 5 is increasing and where it is decreasing. Determine the intervals on which the function 𝑦 = 7 𝑥 𝑥 − 8 is increasing and on which it is decreasing.